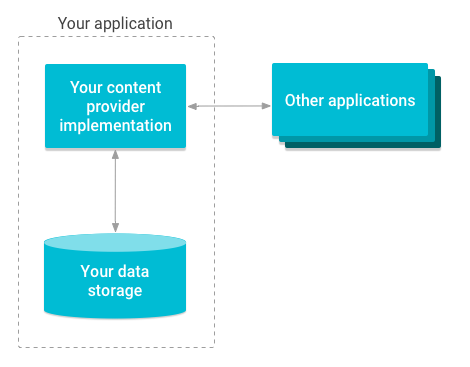 Content providers can help an application manage access to data stored by itself, stored by other apps, and provide a way to share data with other apps. They encapsulate the data, and provide mechanisms for defining data security. Content providers are the standard interface that connects data in one process with code running in another process. Implementing a content provider has many advantages. Most importantly you can configure a content provider to allow other applications to securely access and modify your app data as illustrated in figure 1. Figure 1. Overview diagram of how content providers manage access to storage. Use content providers if you plan to share data. If you don’t plan to share data, you may still use them because they provide a nice abstraction, but you don’t have to. This abstraction allows you to make modifications to your application data storage implementation without affecting other existing applications that rely on access to your data. In this scenario only your content provider is affected and not the applications that access it. For example, you might swap out a SQLite database for alternative storage as illustrated in figure 2. Figure 2. 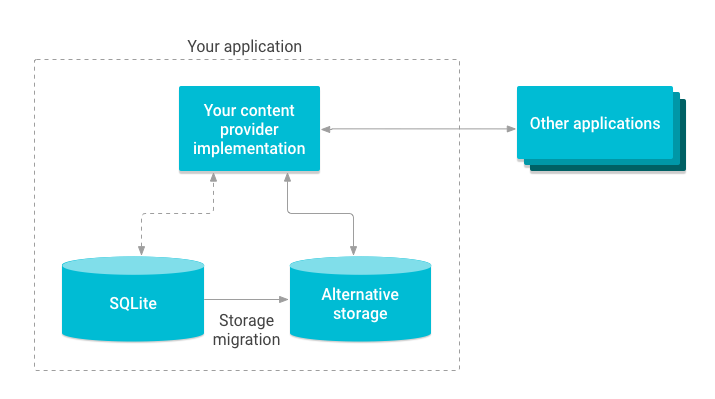 Illustration of migrating content provider storage. The Android framework includes content providers that manage data such as audio, video, images, and personal contact information. You can see some of them listed in the reference documentation for the android.provider package. With some restrictions, these providers are accessible to any Android application. A content provider can be used to manage access to a variety of data storage sources, including both structured data, such as a SQLite relational database, or unstructured data such as image files. For more information on the types of storage available on Android, see Storage options, as well as Designing data storage. Content providers offer granular control over the permissions for accessing data. You can choose to restrict access to a content provider from solely within your application, grant blanket permission to access data from other applications, or configure different permissions for reading and writing data. For more information on using content providers securely, see Security tips for storing data, as well as Content provider permissions. You can use a content provider to abstract away the details for accessing different data sources in your application. For example, your application might store structured records in a SQLite database, as well as video and audio files. You can use a content provider to access all of this data, if you implement this development pattern in your application. Also note that CursorLoader objects rely on content providers to run asynchronous queries and then return the results to the UI layer in your application. For more information on using a CursorLoader to load data in the background, see Running a query with a CursorLoader. How to access and update data using an existing content provider. How to design and implement your own content provider. How to access the Calendar provider that is part of the Android platform. How to access the Contacts provider that is part of the Android platform.